The Wall Street Journal today has an article by Diana Middleton on translation and interpreting jobs. While some of the information is of doubtful value ("Interpreters can earn between $15 and $30 per hour": interpreters - especially conference interpreters - can earn much more than that, apart from those who work in phone interpreting and certain "community" interpreting services), the article on the whole will provide some useful insight to those that don't know much about our profession (kudos to Ms. Middleton for getting right the distinction between translation and interpreting, so often confused in the press). 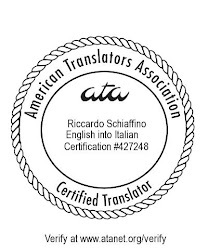 Ms. Middleton had the good sense to rely on people who are knowledgeable about our industry - for example, prominent among the people quoted is fellow translation blogger Judy Jenner of Translation Times (congratulations, Judy!). I completely agree with your analysis, Riccardo. I am not sure where the Common Sense Advisory, which is responsible for that interpreter data, gets their numbers from. They sound awfully low to me. While I am certainly very glad that the WSJ gave our industry some coverage, I was hoping to see a bit more of an in-depth article. In my 45-minute interview, I spoke at length about professional development, associations, crowdsourcing, threats to our business (machine translation, low overseas rates), future of translation/interpretation, etc. I was hoping it would go more in that direction, but of course space was limited and it was meant to be more of an overview of the industry. My recommendation so that our profession gets some more coverage: log on to the article on Wall Street Journal and leave a comment. The more discussion, the better, and perhaps it will prompt the WSJ to extend coverage about us: the big players in globalization! I don't think the verb "lounging" (by the pool) is a good way for Ms. Middleton to express what I do. What I said is that as freelancers, we are in the lucky position to complete assignments NOT tied to a cubicle (which I was for years as an in-house translator). I suggested we take advantage of technology (wifi!) to work wherever we'd like. And yes, I sometimes work by the pool, but the glare kills me. The point: "lounging by the pool" somewhat trivializes what we do, but unfortunately, I had no control over what got written. Thanks for the kudos, Riccardo. The article was two months in the making, and I am glad to see it finally happened. I had similar thoughts when I read the article, Riccardo, and it is very good to read your comments here, Judy. Well, according to http://www.articlesbase.com/international-business-articles/the-steep-hidden-costs-of-free-translations-2909135.html, even the EU is advocating paying more for your translations if you want to succeed abroad!